Everyone has a signature recipe right? I’ve tinkered with a bunch of meatball concoctions and still circle back to this one each year when we make our high holiday meal. In fact, this is one recipe that can be made anytime because frankly? They are sooooo yummy! So, these are aptly referred to as Aunt Debi’s meatballs. Why? Because my niece AKA Little Miss Party gave them that handle and ever since I’ve passed along the recipe to her, she has shared it with others. Now, if memory serves me right, I think it was this meatball recipe that was given to a close male friend of hers. He wanted to make an easy meal to impress the lady he was starting to date. They are married now so clearly his balls (my balls?) (these meatballs?) were cupid’s catalyst for love. Okay, so what’s in them? Not really anything so secretive. I start with the basics: ground chicken, eggs, seasonings and breadcrumbs. Oh, but wait. Not just any breadcrumbs…..they have to be fresh Challah crumbs. This was something my mom taught me. A meatball or a burger is really nothing spectacular until you add the noteworthy Challah crumb. Challah (or egg bread) is light, moist and literally bounces air into any ground meat mixture. Next time you try it let me know if my mom was right. Moving on to the sauce. It’s easy. A jar of store bought spaghetti sauce. One tin of tomato sauce, one tin of tomato paste, some brown sugar and then once they have cooked for an hour, throw in a can of whole cranberry sauce and 1 can of ginger ale or sprite. Ya, you heard me. There’s soda pop in DEEZE balls. Most likely why they taste so good. Keep in mind, these are special occasion balls. You are not going to be eating a sugary main dish every day (even though the thought has crossed my mind over and over again). Directions: 1. Mix all ingredients for the meatballs and set aside. 2. In a large pot or dutch oven, bring ingredients for sauce #1 to a slow boil. 3. 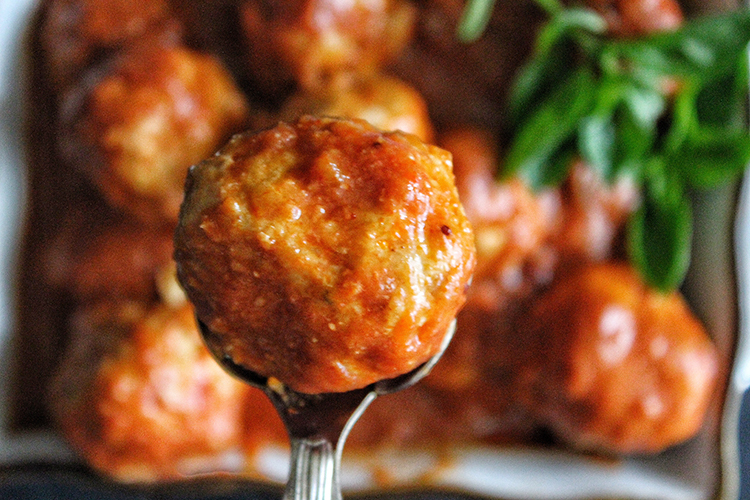 With wet hands, form a golf ball size meatball and drop into simmering sauce. Once all your meatballs are in the pot, DO NOT STIR. In fact, step away from the pot for at least 10-15 minutes. This is the trick to ensure that your meatballs don't transform into a MEAT sauce. 4. Give the pot a good shake once you see the meatballs look lightly cooked. Cover and simmer for one hour. 5. For the second hour, add sauce #2 ingredients into the pot. Continue simmering for another 60 minutes covered. Can be made ahead and frozen or served hot. P.S. I completely forgot to add in the tomato paste when I made these last week because I dunno why. No one knew the difference and there were absolutely NO leftovers in sight. But you can be darn sure that next time, I’m stashing a few extra balls for myself.